My name is Mark Richard Rauschkolb, and I have been researching my family history for almost twenty years. When I started, I knew little of our family history, so I started by contacting every Rauschkolb that I could find. I also wrote down every Rauschkolb reference that I found in books or on microfilm. This gave me a great deal of information, much of it about lines that are not connected to mine, at least not here in America. I have created this site as a place to share the information that I have collected with the people who might be interested in it. It also gives others a place to find me, so that they can share what they know. 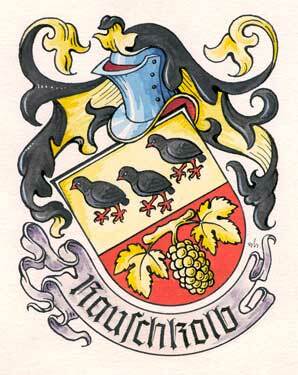 Rauschkolb - A Really Old Name? While researching our family history, I could rarely find any information about the name, which made me think that our family name has to be relatively "new" -- an "old" name would have been written about. Well, I recently heard from a friend in Germany, who changed my mind on this. My friend Heiner, who found me because of this website, has access to "The Chronicle of Wachenheim" which is a book from the early 1900s about the history of the town of Wachenheim, a town near the Rhein River that also happens to be the location of the Rauschkolb Winery (more about the winery and it's current owner down below). The earliest Rauschkolb reference that he has found in this book, is for a Catholic priest in the year 1323! The tree listed above is a traditional family tree -- it looks good on paper, but there is so much more that can be done with the information. I have created a program that builds "interactive" family trees that use the power of the web to display family tree information, and so much more. The trees below contains two types of links. If you click on the number above an individual, the tree will be redisplayed with them at the root. If you click on a "More Info" link, a "timeline" will be displayed for that family. The "timeline" includes all of the information that I have for that individual and their spouse, in chronological order. Along with the usual dates, this information includes where they lived and what there occupation was. If you would like me to post your family tree, send me the information and I will format the information and post it! If you have something you would like to see posted, send it to me. If you like what you see, let me know.